Decorating for the holidays is one of the most exciting times of the year for me, and if you follow me on social media, you know I love anything and everything GLAM! For so many years, our family moved around the country to follow my husband’s military career with the United State Navy and that meant we changed homes every 12-24 months. So, for most of my married life, I focused my holiday decorating on items and methods that were easy, classic and would work for any house no matter what state or climate the military would send us to next. I always viewed my decorations as an investment because as a new military spouse, it didn’t take long for me to realize what a waste of money it was to buy something specifically for one house when there was always the possibility for another move before the next holiday season! So, when my husband retired from 23 years in the military, and we chose our retirement home, I decided I was going to continue with my classic style for decorating, but I had to add a touch of GLAM to it! Here are my 3 tips to add some classic, glam to your decorating this year! Lighting – There are so many creative things you can do with lighting now! One of the most beautiful lighting options I love to incorporate into my yard is by using Blinkies (see video below). These lights are randomly blinking C-7 bulbs that magically transform your trees into works of art at darkness. I’ve seen videos of entire neighborhoods that decorate their front yards with them and they are gorgeous in mass numbers like that! I have personally been using these lights for more than 5 years and my neighbors rave about them every winter! And if you live somewhere where it snows, they absolutely glisten and sparkle in the snow! I now easily and quickly string 6 huge evergreens and 3 giant pear trees with the help of this amazing tool! It’s a lifesaver for making tree lights look spectacular and for removing them easily after the holidays! I also put my lights on multi-outlet timers so I don’t even have to think about turning them on or off each evening! I use about 2-3 of these timers around my yard because it makes my life easier. This year, I added random sparkle net lights to my deck and the effect has been gorgeous! It absolutely glistens in the recent snowfall we had! And one of my favorite ways to incorporate lighting during the holidays is something I noticed a lot when we lived in New England briefly. 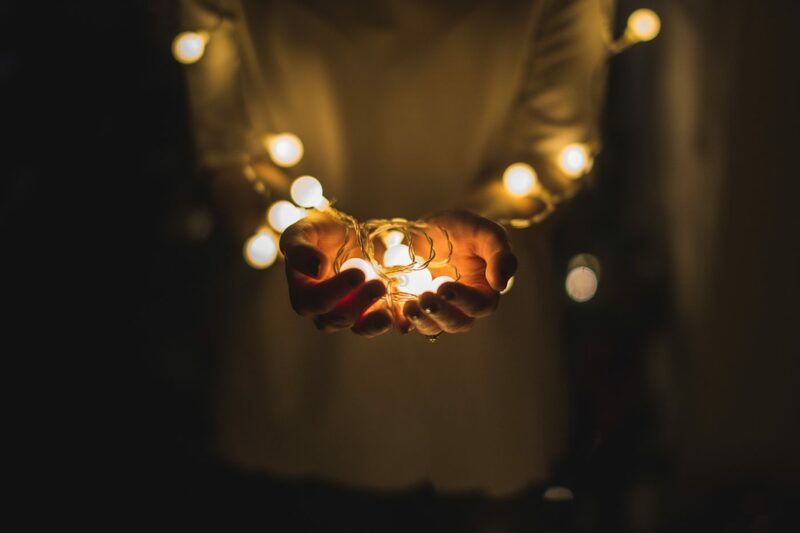 Many of the historic homes used “uplighting” with spotlights during the holiday season and I fell in love with the look! Now, every year, I incorporate my favorite New England tradition at my own home! 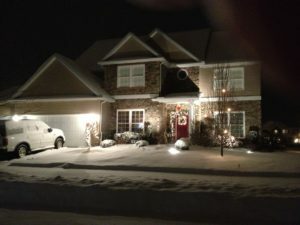 I place spotlights out in front of my home to showcase the features of my house. Greenery, Berries, and Gourds – Something else I noticed in New England was the use of natural things like greenery, berries, and gourds! When we lived in Newport Rhode Island, the luxurious mansions of the rich and wealthy were elaborately decorated for the holidays and I adopted some of my favorite things I saw at those mansions. After living there, I started incorporating pine and cedar into my outdoor décor. I loved to tuck swags of it into the ornate millwork above the door of our Virginia home. Another gorgeous decorating tip I learned from visiting the mansions was to clip branches of berries and tuck those into planters or above my door, as well. I also started gilding gourds, pomegranates, and even pineapples – just like the ones I saw on display in Newport, Rhode Island! I love to buy various sizes and shapes of pumpkins and gourds for the Fall and stack them on my doorstep… but once I start decorating for the holidays, I grab a can of metallic gold spray paint and I spray them all gold! They look gorgeous in window sills, or layered in empty planters or tied into any other outdoor decorations! I even used to place smaller gold items above my front door with a gold pineapple in the very center! Garlands & Swags – Something else I loved about the decorations for the Newport mansions was the use of greenery for garlands and swags. 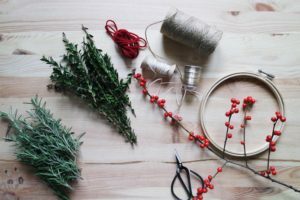 The following year after visiting the luxurious estates during the holidays, I decided to make my own garlands for my house. I made 50 feet of garlands by clipping cedar branches and twisting the floral green wire around the branches. 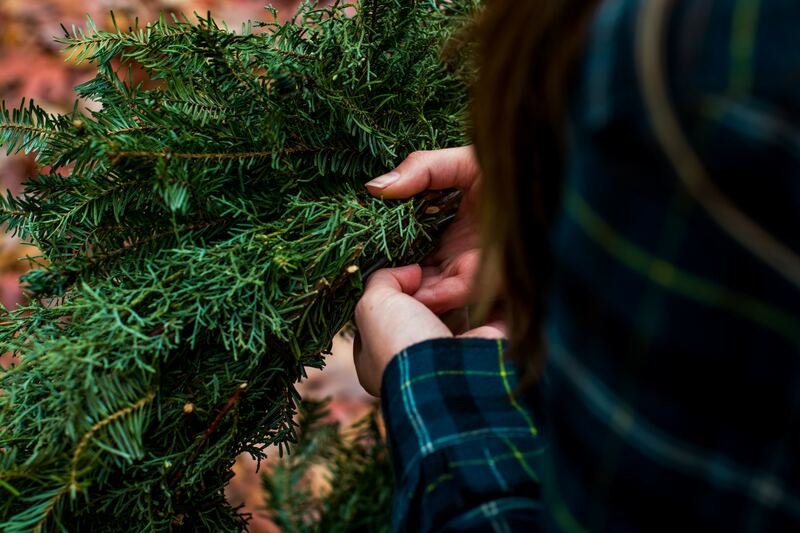 If you live around evergreen trees, this may be an option for you, as well! If not, you may be able to find some premade garland at your local hardware store. I’ve been able to find pine roping, cedar garland and a mixture of both. Sometimes these are available for purchase at Christmas tree farms, as well. And these are the reusable ties that I just bought for hanging my 5-foot long swags on the front of my house and attaching my garland to my deck railing. 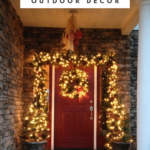 I’ve also been using this amazing garland hanger for my front door to hold heavy garland with no problem! I loved it so much outside that I bought 2 more for my large, double-wide indoor walkways to hang garland there, as well! Here is a video to show you how gorgeous the lights look at dusk and at nightfall! 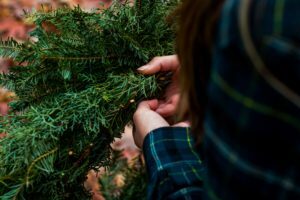 If you incorporate any of these GLAM holiday décor tips into your outdoor decoration, let me know! Drop me a comment below or find me on social media to tell me how you did it? I’d love to be inspired by YOU!